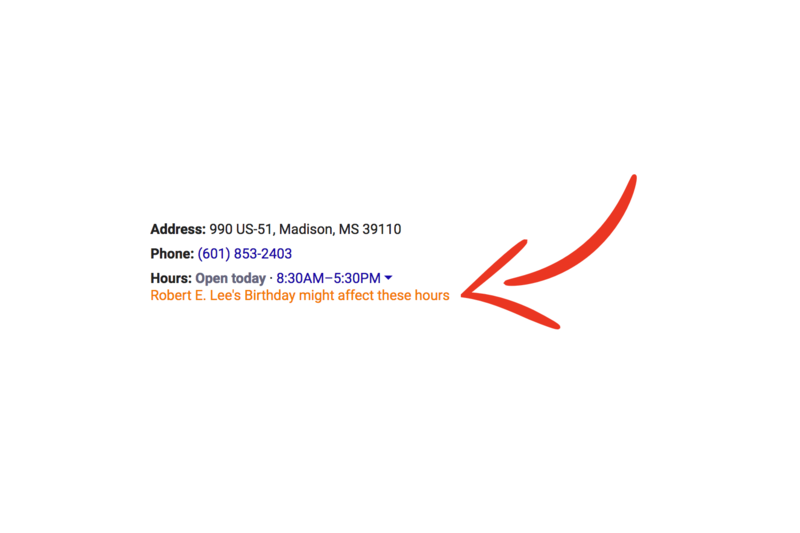 What is Google Implying Your Business is Celebrating Today? MLK or Robert E. Lee? For the record, we’re open for regular hours today. I’ve always appreciated Google’s warnings on potential holidays that the listed store hours may be inaccurate due to the holiday. But this doesn’t feel like that. This isn’t a warning solely about the widely accepted, non-controversial Martin Luther King Jr. Day. This is the insertion of a controversial subject that most don’t want their business or organization associated with based solely on geography. Geographic segregation. The United States Postal Service clearly states that they’ll be closed today due to MLK Day. I have no information or supporting evidence/documentation, but my inclination is that Google is trying to make a statement. The theory being that if they split the holiday by states, it’ll frustrate enough people—such as it has me—in those states that the backlash in the media will result in our typical knee-jerk political action to no longer recognize Robert E. Lee’s birthday. The problem is that Google has done this at the expense of its own customers. The average person doesn’t know how that information is populated in Google, so many people will Google places today, and subsequently think a controversial holiday is being celebrated by that company/organization. Google is using the reliance many have on it to imply something in what seems to be political activism* that is unfounded and based solely on geographic location. *I say political activism because if it was truly just based on the states’ legal recognition it would say both MLK and Robert E. Lee. So on a day celebrating, among many other things, the desegregation of our great country, many are being unfairly harmed due to segregation. Google has now edited the warning to feature both Martin Luther King Jr. and Robert E. Lee.